I'm told that Catawba County voters haven't elected a Democrat to the county commission in over 30 years. No Democrat even bothered to file for the office in 2016, and going back many election cycles on the State Board of Elections site, I found some Democrats on the ballot in various years, but none of them ever came close to taking a seat. This year there are three Democrats on the ballot for the Catawba County Commission, all women, all exceptional in one way or another. You can read about all of them on the Catawba Democratic Party website. 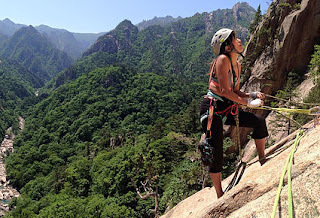 I'm particularly drawn to Geniey (pronounced gee-knee) Yang, an Asian-American woman of 30 who's been an international teacher of English and is also an accomplished rock-climber: "I got on the rocks and never looked back. It guides my travel plans and has a key impact on how I govern my life. Rock climbing has taken me to some of the most exquisite places in the world. It has been the guiding light to my self-assurance, assessing different situations, and preparing for all things possible." Geniey's family was part of the Hmong (the 'h' is silent) immigration to the United States in the late 1980s. The Hmong were ethnically Chinese living mainly in the mountains of Laos and Vietnam. Many of them helped American forces in the Vietnamese War, and after the Pathet Lao seized control of Laos, they began a brutal persecution of the Hmong. 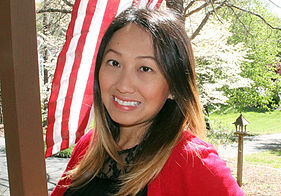 Hmong refugees fled to Thailand, and from there many immigrated to the United States, some of them to Catawba and Burke counties in North Carolina where they have become well established as professional workers of all kinds, farmers (they excel at agriculture), and in the case of Geniey, a candidate for public office. I hear from insiders in Catawba that Geniey and her team of volunteers have already knocked over 4,000 doors in the county. That kind of commitment and out-reach is golden. Observing her energy and commitment, a Catawba County Democrat told me, "a young Asian woman knocking doors every day of the week in rural Catawba County is very impressive." More than impressive, I'd say. #2018BlueWave courageous! Geniey writes, "My drive for progress and satisfaction is fearless, and it is tantamount to what I feel for my community. I have seen the proof of universal strength of community repeatedly through my travels across the world -- people taking care of people, neighbors pulling together for the benefit of all .... we must all strive to be better than we are. I believe in self-betterment and looking after one another. To make that a reality, I am ready and dedicated to give back to my community." I was already watching Catawba County because of candidates like Kim Bost and Ric Vandett and David Wilson Brown and DD Adams. Geniey Yang gives me a tingling sensation that 2018 ain't like any other year in Catawba and in many other North Carolina counties.